Sense of the Lense | Loisaida Inc. 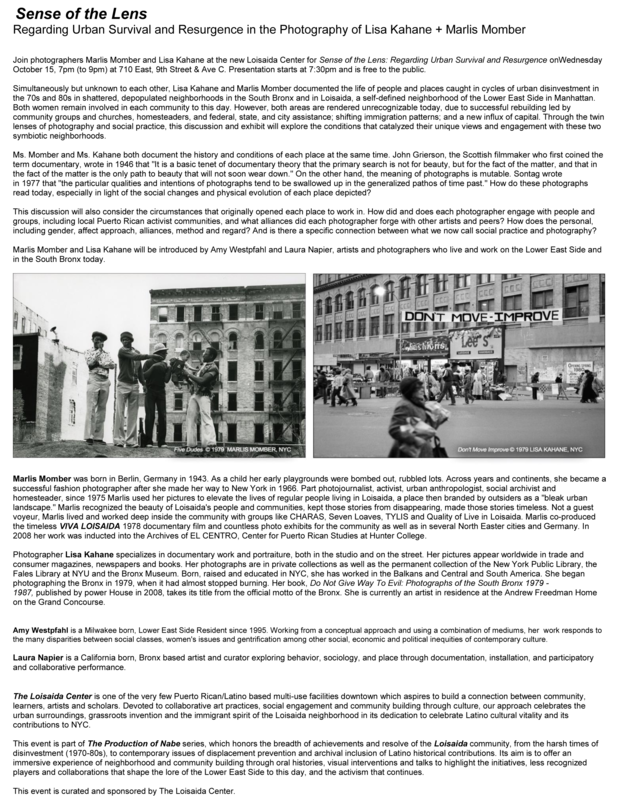 Simultaneously but unknown to each other, Lisa Kahane and Marlis Momber documented the life of people and places caught in cycles of urban disinvestment in the 70s and 80s in shattered, depopulated neighborhoods in the South Bronx and in Loisaida, a self-defined neighborhood of the Lower East Side in Manhattan. Both women remain involved in each community to this day. However, both areas are rendered unrecognizable today, due to successful rebuilding led by community groups and churches, homesteaders, and federal, state, and city assistance; shifting immigration patterns; and a new influx of capital. Through the twin lenses of photography and social practice, this discussion and exhibit will explore the conditions that catalyzed their unique views and engagement with these two symbiotic neighborhoods.